As much as I like cooking food at home, I actually adore going out for dinner. Growing up as one of four kids, meals at restaurants were few and far between and mostly happened during the summers we spent in the South of France. Visits to restaurants are more frequent for me these days, yet having dinner at a restaurant still feels special. And I would actually like to keep it that way. I much prefer to eat at home as a general rule and save those restaurant visits for special occasions (and very special meals). And when I do go for dinner at a restaurant, I love the entire experience. A glass of bubbly while I peruse the menu, ideally already accompanied by a few small bites ‘courtesy of the chef’. If I am lucky, the menu is one that leaves me struggling to decide what to eat thanks to the myriad of enticing options: dishes composed of ingredients I (i) either don’t know, (ii) have yet to try; (iii) struggle to track down myself or (iv) find too laborious to prepare in my own kitchen, ideally combining all of the above. And there are rules. No single dish is ordered more than once. So my dinner companion(s) and I can try as many dishes as possible. And there has to be dessert. There always has to be dessert. And coffee. And if I am really lucky the coffee is as good as the meal itself. And as a final hurrah before peeling ourselves off our chairs and waddling home, our bellies and hearts full, a plate of petit fours arrives – minuscule madeleines and financiers, a chocolate truffle or two or a couple of cubes of pate de fruits, just like these tamarind ones. While I like something sweet alongside my post-dinner coffee (or that 4pm coffee in the office to get me through the afternoon slump), that something sweet does not need to be particularly big. 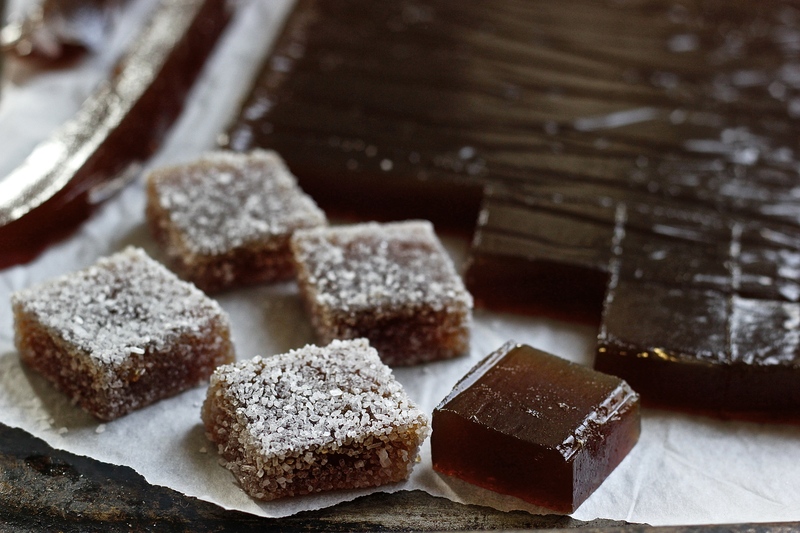 In fact, a one-bite affair is perfect – a square of bitter chocolate with flecks of sea salt, a beautifully plump date, a single piece of shortbread or indeed a small cube of pate de fruit. This Tamarind Pate de Fruit recipe came about as I was brainstorming other recipes to make with tamarind, well before I even started gathering recipe ideas for this Goes Well With Coffee series. While I love using tamarind to make Agua Fresca or to Pad Thai and have even made a Tamarind Curd before, it was about time I expanded my repertoire of tamarind recipes – especially as each packet of tamarind pulp typically contains far more tamarind pulp than a single recipe will ask for. Why a Tamarind Pate de Fruit? You can make Pate de Fruit with almost any fruit – the exact formula you use will depend on whether you are using high or low pectin fruit, but other than that the basic recipe does not change much. And tamarind just happens to be a flavour I adore. Not only is tamarind mouthpuckeringly sour but it also has this really complex flavour which reminds me of dried fruits that are naturally a bit tart, like dried cherries or dried barberries. Tamarind pate de fruit also goes rather well with coffee. In fact, one of the other coffee flavour wheels I came across while reading up about the flavour profiles of coffee explicitly lists tamarind as one of the flavours you might detect in your cup of coffee. The SCAA’s flavour wheel does not list tamarind as a flavour but does list ‘candy-like’ as one of the aromas you might detect in coffee. And so I could not think of a better candy to enjoy alongside a post-dinner cup of coffee then a piece of tamarind pate de fruit! Note: This recipes makes a lot of pate de fruit – about 40 pieces (more if you cut them smaller). While you can half the recipe, I would only do so if you have an instant read sugar thermometer or a saucepan small enough to allow for a proper reading on your thermometer so you know when the pate de fruit has cooked long enough. Sadly my kitchen lacks both so I used a medium-sized saucepan and my trusty thermometer my sister gave me. In any event, stored somewhere cool in an airtight container, the pate de fruit will keep for a few weeks. As an alternative to serving the pate de fruit alongside coffee, you can also serve it with cheese, similar to the way you eat membrillo or chutneys with cheese (if so, skip the part where you roll the pate de fruit in sugar). Line a sheet pan with silpat or parchment paper. Set aside. In a medium saucepan combine the tamarind water with the preserving sugar. Bring to a boil. As soon as the mixture starts boiling, reduce the temperature and continue to cook the mixture, stirring frequently so it doesn’t catch on the bottom of the saucepan, until the mixture reaches a temperature of 108 degrees Celsius – this should take between 30 to 45 minutes. Pour the pate de fruit onto the prepared sheet pan and leave to dry (uncovered) at room temperature for 1-2 days (the pate de fruit will be softer if you only wait for 1 day – personally I prefer the slightly chewier pate de fruit you get after waiting an additional day). Using a sharp and well oiled knife, cut the pate de fruit into small cubes (alternatively you can use a small cookie cutter). Roll in the sugar. Stored in an airtight container the pate de fruit will keep for a couple of weeks. *To make the tamarind water soak 100g of seedless tamarind pulp in 500ml of hot water. Set aside to soak for 1 hour. Strain and measure out 500ml. The rest of the tamarind water can be used for salad dressings, added to iced tea or sweetened and mixed with sparkling water for tamarind lemonade. Now I am jealous! I only ever once tried fresh tamarind (at a cooking course during our trip to Bali last year)! Hope you had a wonderful trip – St Lucia sounds like a dream destination!